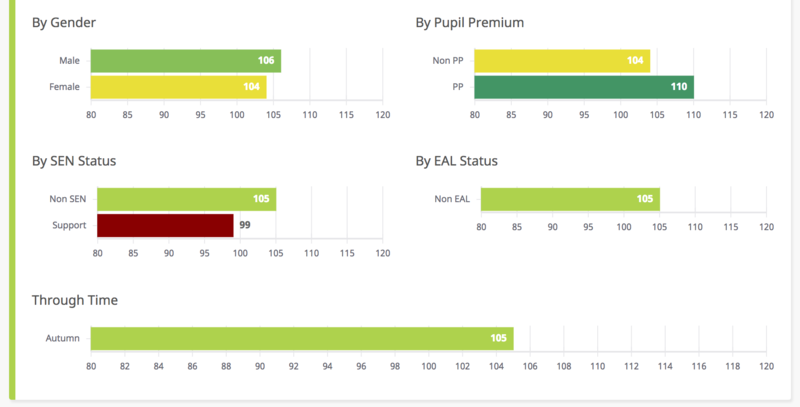 Once Assembly has calculated scaled score equivalents for each pupil, we're then able to average these out across relevant groupings and produce your dashboard. For an explanation of how these scores are calculated, please refer to this support article. Average Scaled Score: this measure is a fairly simple average of each individual pupil's scaled score equivalent in your school or MAT. Expected+: this measure displays the percentage of students who have a scaled score equivalent of 100 or above in the given subject. High Score: this measures displays the percentage of students who have a scaled score equivalent of 110 or above in the given subject. For each measure, various breakdowns are shown for year group, gender, pupil premium, EAL and SEN status. 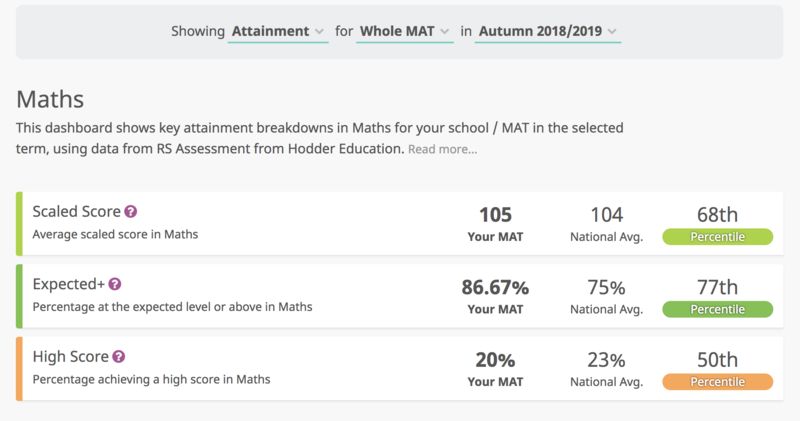 The data from your school or MAT is displayed next to national averages and percentiles, to give an indication of how you fit in to the national context. This comparative data is calculated from the latest KS2 performance tables, which show the KS2 SATs results for every school in the country. We create a school-level distribution with percentiles for each measure and map your school or MAT's performance back to the performance of other schools in the country. We use this comparison to colour-code your data, with the colour of a measure changing each decile. For example, if your school or MAT is in the top 10% for a given measure, the bar will be coloured a dark green. If your school or MAT is in the bottom 10% for a given measure, the bar will be coloured a dark red - with colours changing at 10% intervals along the scale.